The Pure-Fit® SC Sterile Connectors are designed to fit perfectly with Saint-Gobain's market-leading hose & tubing. We can supply the extensive range of Sani-Tech, SaniPure, PharMed & Tygon hose & tubing alongside the Pure-Fit® SC to offer a trustworthy & leak-free solution. Pure-Fit® SC Sterile Connector is innovative connective technology, giving the ability to create true sterile connections anywhere – even outside the clean room environment. It incorporates Saint-Gobain's exclusive Pure-Fit® SIB® (smooth inner bore) technology, which provides a seamless transition between tubing and fittings in order to maintain complete fluid integrity. 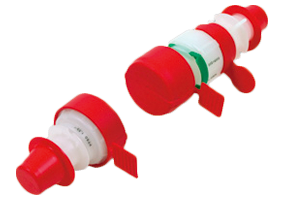 The silicone valve design of Pure-Fit® sterile connectors make it easy to assemble & promises no gaps or residue, eliminating problems associated with other systems. The excellent locking mechanism virtually eliminates the possibility of operator error and simplifies validation, saving you time and money. To further discuss the Pure-Fit Sterile Connectors and how we can help you. Please contact us, or request a callback at a convenient time to suit you.